FREE! A family and dog friendly Halloween event along Richmond Road – where jack-o-lanterns decorate the sidewalks, and businesses hand out goodies to trick-or-treat’ers. 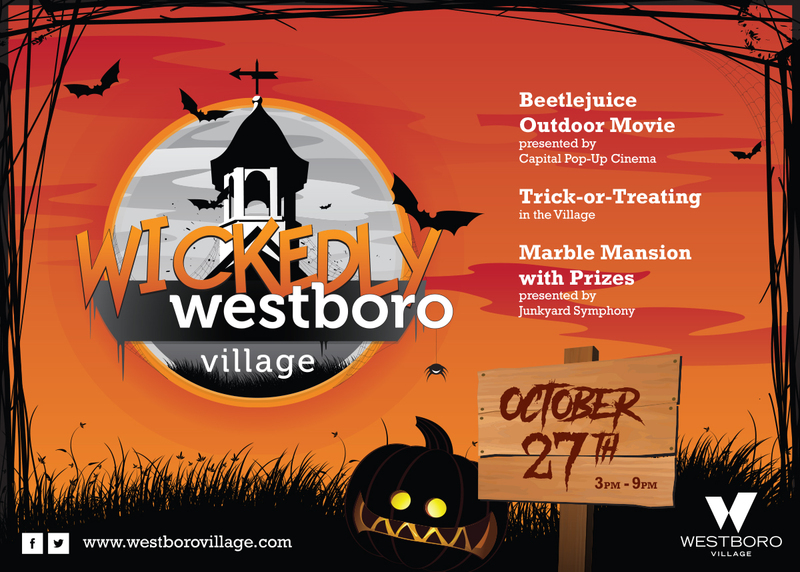 Kids can pick up their official Westboro Village trick-or-treat back pack at Winston Square, play the Marble Mansion for prizes, then walk down Richmond – trick or treating at various participating businesses. Dovercourt’s Bouncy Castle will be at Avenues Garage, then everyone can close the event with a movie under the stars presented by Capital Pop-Up Cinema – Beetlejuice. (there will be heating fans, hot cocoa and cider, too!) – Bring your camping chair! When Ron Benn is not wearing his Bulldog columnist hat, he is a long-time member of the Centrepointe Community Association. Thank you for writing. You are making some important points. I have written to Mr. Smitt with these and other concerns and I am hoping this is all a big misunderstanding and that the report was just improperly written. Not likely, but there is a chance. Otherwise this is ridiculous and it also has an impact on several areas in our ward. Furthermore, if this is the case, I would be very suspicious of the timing. The middle of an election is sometimes selected because an issue has to compete with many others for attention. Also, in an election, councillors are governed by “black-out-period” rules and they are prohibited from notifying residents of issues coming to committee and council. Anyway, I expect an answer in the morning. To read the report to which Chiarelli is responding, click here. You scrimped and saved and did without for decades so you could buy a home for your family. Perhaps you expect to be able to sell your home to help cover some of the costs of your retirement. But the City of Ottawa wants to put a high-rise building beside your home if you live within just less than half a kilometre from a main street. So your life’s work has a building of unlimited height taking away your privacy and your home’s value. Essentially the city wants to transfer the value lost in your home into the massive profits of the development industry. City council and staff don’t represent you. They represent the interests of developers. Oh yes, the city will call this intensification and give a thousand reasons why it is ecologically and economically sound. But don’t kid yourself. Developers can still build in wide swaths in the suburbs and they can take away the enjoyment and value of your home by being able to build in some of the most desirable and traditional locations downtown. Furthermore the planning department is funded by development money in one of the grossest conflicts in modern government. This is a cash grab … a huge cash grab. Such a bylaw if passed next Tuesday at planning committee will decimate the old neighbourhoods of such communities as The Glebe, New Edinburgh, Westboro and Wellington Village. If you live in those neighbourhoods, I would advise you to sell your home immediately for fear of having a huge skyscraper built just beyond your back fence. I’m not being frivolous about selling. I’m dead serious. The city is quite prepared to have you lose a large portion of your life’s investment in your home. Developers now have the run of the suburbs and downtown neighbourhoods. They run this city rather than the mayor or city council and they wield power over the local media through the power of their hefty advertising. They control our municipal government through their campaign funding of local politicians. And the payback to developers is giving them the run of the city for a pissy little job on council. Ottawa municipal government has sold itself to the development industry. This is grossest misuse of municipal government power I’ve seen since I started covering city hall in 1998. The question that baffles me (actually I have my suspicions about what is going on but I can’t authenticate them) is why politicians and staff would choose to support developers over their constituents. The politicians must be getting back from builders something very valuable. Our city council is probably the weakest one I have ever seen in Ottawa. The majority of its members are lazy (only about a third of them read the reports they are given by staff), incompetent because they don’t understand what is put in front of them, possibly stupid, without backbone (they can be whipped into a vote by Mayor Jim Watson in a microsecond) and horribly unethical. This is a sad representation of a very smart but woefully apathetic community. Wake up. Your property value is being taken while you sleep. Your councillors, the mayor and city staff don’t care about you. You should know this and be concerned about it. But politicians and city staff are hopeful that you are too apathetic to care until the 31-storey high-rise looms over your garage. You’ll wish you had followed municipal politics long before your home value is decimated by a city hall which cares more for developers than the people they are supposed to represent. So let’s get back to ways the residents of this community can win proper municipal representation. Unless your current councillor is very competent, vote them out. Very few of Ottawa’s councillors are good at what they do. In particular, Barrhaven residents should dismiss councillor and planning committee chairwoman Jan Harder. Harder is a case of someone who wants power but has become way too close to the development community. She is a good example of someone who has never had power in their lives and when she gets it, she goes wild with it. Harder has forgotten who she represents and that’s the residents of Ottawa, not developers. Harder should never have been appointed chairwoman of planning committee and should not be chairwoman now. She has done nothing to see that her residents are safe at dangerous level crossings on the Via Rail line north of Barrhaven where at one, a tragic accident occurred between an OC Transpo bus and a Via Rail train. She is the head of the planning committee which can’t get light rail to Kanata and Barrhaven. Then she and Mayor Jim Watson announce a $60,000 environmental study (taken from city revenue) for light rail to Barrhaven. Both she and Watson know that this study will expire long before light rail is to come to Barrhaven long past 2031. They have spent $60,000 to make it look that they are bringing LRT soon to Barrhaven so as to help the mayor’s and Harder’s re-election chances. As well, Ottawans should throw Watson out of office. The mayor has created this developer-dominated city government and has been the architect of the anti-democratic processes that preceded the passing of the 65-storey Albert Ave. project and the adoption of the height and zoning report with virtually no public input. This process, if you can call it that, are completely and absolutely wrong. Your agent would strongly advise voters to support former councillor Clive Doucet for mayor. He will put an end to these kinds of abuses. I don’t agree with a few of his policies but I know in my personal dealings with Doucet that he is an honest and well-meaning man. And municipal Ottawa desperately needs an honest man. It has got to the point at city hall where residents, taxpayers and citizens are perceived as nuisances rather than the heart of democracy. This is not an exaggeration. Ottawa City Council and city staff are out of control. An Ottawa city councillor is calling for a halt to a deal with the National Capital Commission that would leave what he calls “the best part” of Rochester Field in Westboro open to development. Under the proposal, which is tied to an agreement with the city to extend light rail farther west, 80 per cent of the NCC-owned property would be retained as open space for public use. But the proposal, to be heard at next week’s planning committee, would rezone the remaining portion of the pistol-shaped field to allow for six-storey mixed-use buildings along Richmond Road, a change that is not sitting well with either neighbourhood groups or the ward’s councillor, Jeff Leiper, who accuses planners of rushing the process. In his written comments on the proposal, Leiper complains rapid intensification has already robbed Westboro of most of its available green space. “For over a century, Rochester Field has been a jewel in Westboro. If a plan being rushed forward through City zoning by the National Capital Commission (NCC) proceeds, we’ll lose the best parts of it forever,” he wrote. Rochester Field, bounded by the Sir John A. Macdonald Parkway to the north and Richmond Road to the south, is part of an NCC-owned piece of land that includes the historical Maplelawn property and the Keg Manor restaurant. The city’s dispute with the NCC over the land goes back to 2003, when the city’s official plan designated most of the field as major open space, limiting what the federal landowner could do with the property. The NCC appealed that designation, but the appeal was never resolved. In 2014, the city announced it wanted to run the future western expansion of the light rail transit system above ground for 500 metres along the northern edge of Rochester Field, but the NCC opposed that plan. The two sides eventually came to an agreement to move the trains under the Sir John A. Macdonald Parkway. The city agreed to pay the NCC $30 million as part of the deal, and also agreed to permit future development along Richmond Road. The NCC’s most recent plan calls for the development of two parcels along Richmond Road, divided by a pedestrian corridor connecting to the parkway. The Westboro Community Association and the McKellar Park Community Association also wrote to register their opposition to the NCC’s plan. The city’s planning committee is scheduled to discuss the proposal when it meets on Jan. 23.